For personal reasons I've been away from the blog for much of the last few months, but today I feel compelled to write. Last year on this day, a Saturday, I sang in the synagogue morning service, and as usual near the end I participated in the saying of the mourner's kaddish. Though not required of me because my parents and siblings are all still living, it's something that I choose to do whenever I am in a synagogue (or any house of worship), in memory of all the members of my family lost over the years, in the Holocaust and later, through natural causes and by other circumstances. I say the prayer for my grandparents and my great-aunt and great-uncle, my great-grandmother Rivka (for whom I was named and who often feels present in the periphery of my life, though she died long before I was born and I never met her). I say the prayer for my husband's father who died in 2003 and for whom I continue to feel a deep affection. And I say it in solidarity with all parts of the human community that are dealing with lost loved ones every day. That day last year was particularly poignant though. I know because I made a note of it in my calendar. That day I said Kaddish for all the women who have been the focus of rage and violence, often from men, sometimes known to them and sometimes not. On Dec.6 1989, Marc Lépine, stalked through classrooms corridors and a cafeteria at the École Polytechnique in Montreal armed with a semi-automatic rifle and a hunting knife, on a deliberate and premeditated murderous rampage targeting women. He proceeded to kill fourteen women as well as injure four men and ten women before turning the gun on himself. In his suicide note he blamed feminists for ruining his life and in letters to his friends released later in the press, he outlined his motivation for the attack as supposedly reasonable anger towards feminists for seeking social changes that "retain the advantages of being women [...] while trying to grab those of the men." Fourteen bright young lives were snuffed out in under twenty minutes in a brutal act of misplaced rage and hostility. Fourteen vibrant and creative women lost their opportunity to live and love and laugh, to build a life and to contribute their gifts to society, just because they had the temerity to aspire to become something more and one man saw their fortitude as a threat to his own thwarted ambition and self-esteem. * Geneviève Bergeron (b. 1968), civil engineering student. * Hélène Colgan (b. 1966), mechanical engineering student. * Nathalie Croteau (b. 1966), mechanical engineering student. * Barbara Daigneault (b. 1967) mechanical engineering student. * Anne-Marie Edward (b. 1968), chemical engineering student. * Maud Haviernick (b. 1960), materials engineering student. * Maryse Laganière (b. 1964), budget clerk, École Polytechnique's finance dept. * Maryse Leclair (b. 1966), materials engineering student. * Anne-Marie Lemay (b. 1967), mechanical engineering student. * Sonia Pelletier (b. 1961), mechanical engineering student. * Michèle Richard (b. 1968), materials engineering student. * Annie St-Arneault (b. 1966), mechanical engineering student. * Annie Turcotte (b. 1969), materials engineering student. * Barbara Klucznik-Widajewicz (b. 1958), nursing student. 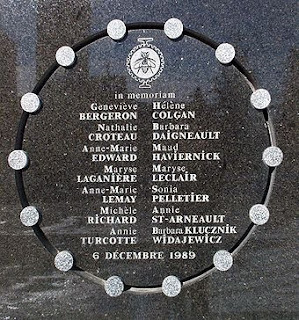 A White Ribbon Campaign was launched in 1991 by a group of men in London, Ontario, in wake of the massacre, for the purpose of raising awareness about the prevalence of male violence against women and commemorative demonstrations are held each year on December 6 across the country in memory of these slain women; numerous memorials have been assembled and the day has been designated National Day of Remembrance and Action on Violence Against Women, a call to action against discrimination and acts of hate against women. I pray that one day soon campaigns like these will have educated men and women everywhere to the point that the fourteen women named above can finally rest in peace.